E.ON looks back at how the 2018 summer(1) heatwave impacted the UK’s energy consumption. This summer was constantly compared to the blistering heatwave of 1976 – in fact, it came so close that it was widely reported as the joint hottest summer since then. Met Office data(2) reveals that 1976 was the hottest summer on average, though only by a small margin (0.33oC). Despite this, when looking at the average temperatures throughout June, July and August, 2018 still appears more frequently in the top three hottest months than 1976. Using this year's scorcher as an example, E.ON investigates how our behaviour during the summer heatwave impacted the nation’s energy consumption at home. In July, John Lewis reported their sales of BBQs had increased by 67%(3). 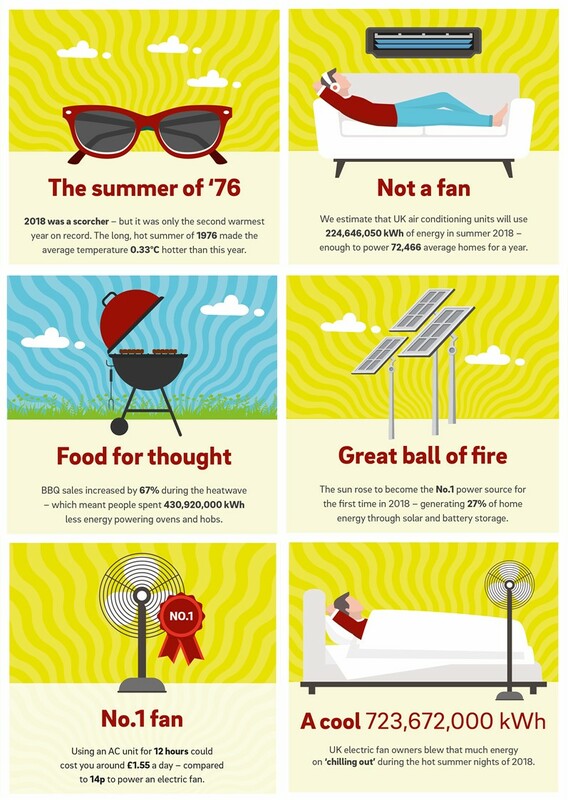 By barbecuing more than usual this summer, E.ON estimates that as a nation, we used 430,920,000 kWh less energy(4) than we would have if we used conventional hobs and ovens. This saves enough to power 130,006 average-sized homes for a year(5). While our appetite for al fresco dining may have reduced our energy use, the cost of keeping cool this summer soared. Research reveals that internet searches for “fans” rose by 140% in 2018 and sales doubled compared to summer last year(3). What’s more, four in five fan owners(6) were found to switch it on at night, in the hope to keep cool and get some sleep. By correlating demand with Met Office weather data, E.ON estimates(7) the total energy consumed by leaving fans on overnight this summer was 723,672,000 kWh. That’s equivalent to powering a whopping 233,443 homes with electricity for a year(5) (or the same as half the size of Cardiff(8)). Fans are by far the more purse-friendly method of keeping cool though – depending on wattage, sleeping with your fan on every night for a week costs up to £0.98(9), whereas aircon could set you back £10.85(3) a week. With the hot weather and lower than average rainfall(10) for the most part of summer, even those not actively looking to save money and energy likely did so by spending more time outdoors. A study found that 23% of us were encouraged by the hot weather to spend more on outdoor activities and experiences(11), getting away from televisions and games consoles at home. For more information, visit the E.ON blog post, The Summer in Stats. 1. Mentions of ‘summer’ refers to the full months of June, July and August. 4. Based on UK households overall having approximately 25.2m more BBQs this year compared to 2016. 7. Based on an approximate 8.7 million households with a 75watt fan on overnight for 12 hours throughout June, July and August. 10. Source: Met Office rainfall information for June, July and August 2018. This press release was distributed by ResponseSource Press Release Wire on behalf of iProspect in the following categories: Environment & Nature, Personal Finance, Manufacturing, Engineering & Energy, for more information visit https://pressreleasewire.responsesource.com/about.